This February ORC attended BioFach, the world’s leading trade fair for organic products, held in Nuremburg, Germany. The event celebrated its founding 25 years ago, with more 2000 exhibitors on an area of over 40.000 square meters in the Exhibition Centre Nuremberg. 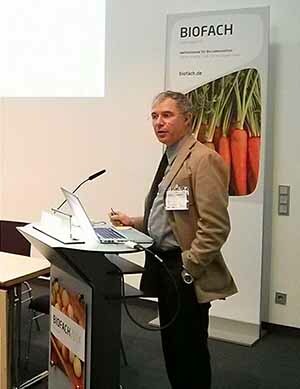 As every year, forums and scientific sessions were held parallel to the exhibition during the three day event, aiming to inform on newest research outcomes and interactively tackling critical questions, closing with the BioFach Science Day on the Friday. The OrganicDataNetwork project organised one of the workshop sessions. Project coordinator Raffaele Zanoli (Università Politecnica delle Marche, Italy) presented an overview of the OrganicDataNetwork. Project partners then presented first results of case studies carried out in six European countries. The studies analysed the current methods of organic market data collection in the different nations and assessed new approaches to improve collection and publication on a national and international basis. Anja Vieweger from The Organic Research Centre gave a first impression on outcomes of the UK case study and final results will be published soon on the ORC website. Regulations and standards are useful to set a base line for marketing but have limitations and are often a deterrent to progress. Sustainability assessment tools provide a useful way of engaging farmers in the process and identifying strengths weaknesses and opportunities.